The Underswamp(?, dt. 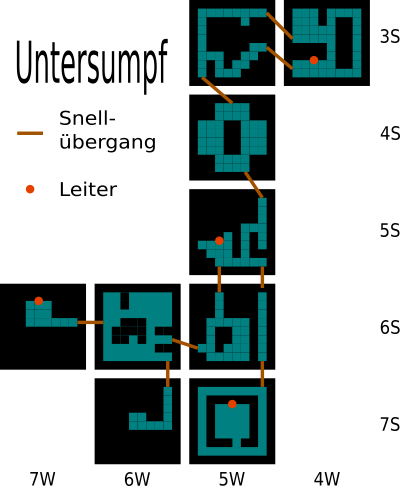 :Untersumpf) is a wet system of tunnels underneath the surface of the swamp, not far in the southwest of Arilon. This area is mostly inhabited by leeches, Meshras and other animals common in the swamp. Hunters should bring patience (or lots of balance) to master walking between numerous leeches. Even some merchants live down here and you may purchase soup of mushrooms and the orange belt. This underground area is connected to the swamp with a total of 4 ladders. The coordinates in the map are made according to the positions of the ladders in the swamp. This page was last modified on 27 October 2007, at 14:55.